Purina AntlerMax Premium Deer Feeds are formulated to maximize every buck’s genetic potential for antlers, optimal reproductive performance and milk production in does, and promote strong and healthy fawns. 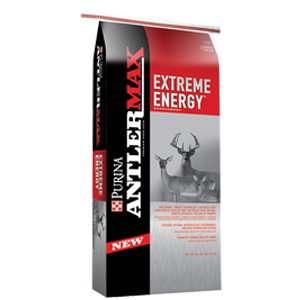 Developed in 1995 as an innovative first from Purina Animal Nutrition, AntlerMax® By-Pass Protein technology promotes antler growth by optimizing protein quality. Protein in traditional deer feed is typically broken down by bacteria in the deer’s rumen and the deer digests the bacteria in its stomach. But the quality of the protein can be degraded by these bacteria, leaving lower quality amino acids available for antler growth. AntlerMax® By-Pass Proteins are protected from being broken down by these bacteria. They “by-pass” the bacteria in the rumen, so the high-quality amino acids are digested in the small intestine, which can support greater antler growth. This is a more beneficial digestion process because it delivers a higher concentration of proteins to the growing antlers. The result helps deliver nutrients to the growing antler for the growth of unbelievable size, speed and mass at earlier ages. This proprietary technology provides an optimal nutritional mineral package for antler development. Proprietary levels and ratios of essential minerals, including chelated minerals, help maximize every buck’s genetic potential for antler growth while supporting reproductive performance in does and helping to produce strong, healthy fawns. At Purina Animal Nutrition, we are constantly researching formulations and innovating to ensure our products achieve superior performance. Our AntlerMax® diets contain twice the amount of proprietary AntlerMax® By-Pass Protein than the original formulations. We’ve enhanced the trace mineral levels and ratios to support antler production at an early age. The fat levels have been increased to promote optimal body condition, and we’ve also increased levels of Vitamin D for calcium and phosphorus utilization. These nutritional enhancements better meet the deer’s nutrient requirements, thus optimizing performance. Purina® AntlerMax® diets are regionally formulated based on our extensive deer liver research that highlights regional mineral deficiencies. Purina® AntlerMax® diets help meet these regionally focused deficiencies. The unique combination of AntlerMax® By-Pass Protein technology, mineral technology, nutritional enhancements and regional formulations culminates in a premium feed, designed specifically for deer. This entry was posted on Monday, December 18th, 2017 at 8:38 pm	and is filed under News & Update, Wildlife, Deer. You can follow any responses to this entry through the RSS 2.0 feed. Both comments and pings are currently closed.